Sometimes food in weird places can be a real selling point. For instance, let's put a restaurant in the shadiest part of town and people will flock to it. Hey, for it to be located there, it must be good! Well, not necessarily, but it is a start. Then you have "meh" food in the most obvious of places. That is when a restaurant benefits from location, location, location. Then there are restaurants that cannot be found unless you knew of it either by pure chance or someone else telling you about it. Wait, I forgot one more... Restaurants that are located in Richmond. Good food, but extra insurance may be required for one's car. Now I didn't need extra insurance nor any defensive driving for this food adventure. The location of the restaurant ensured there would be very little traffic. 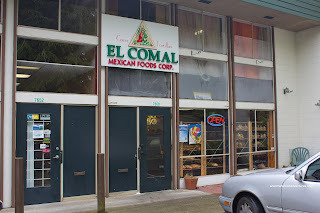 Tucked inside an industrial complex on Winston in Burnaby, El Comal would qualify as one of those secret restaurants. I knew about this place quite a while ago. Someone mentioned it to me, but I never got around to eating there. The day finally came when Big D raved about his meal on a prior visit and insisted we do lunch. Hey, how many times have I passed up food? So Mexican food eh? That's like rolling the dice up here in the GVRD. 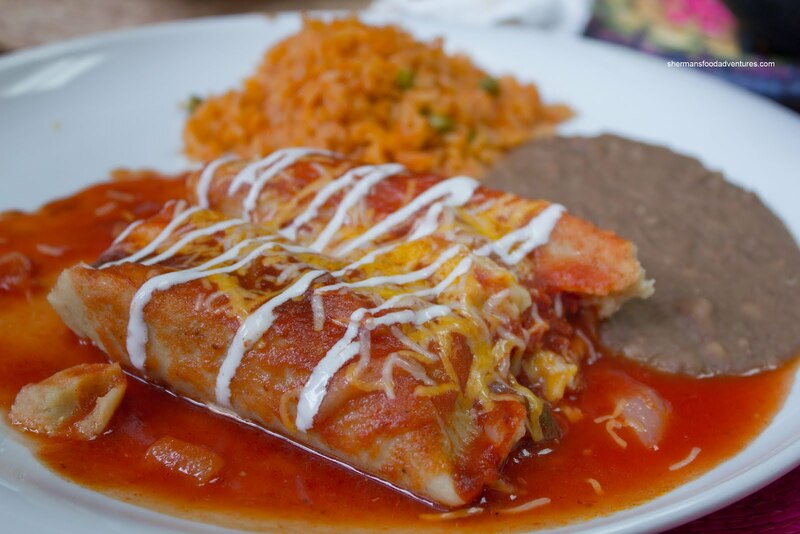 However, I've had some good experiences with Mexican food as of late with visits to Taqueria Jalisco and Taqueria Playa Tropical. 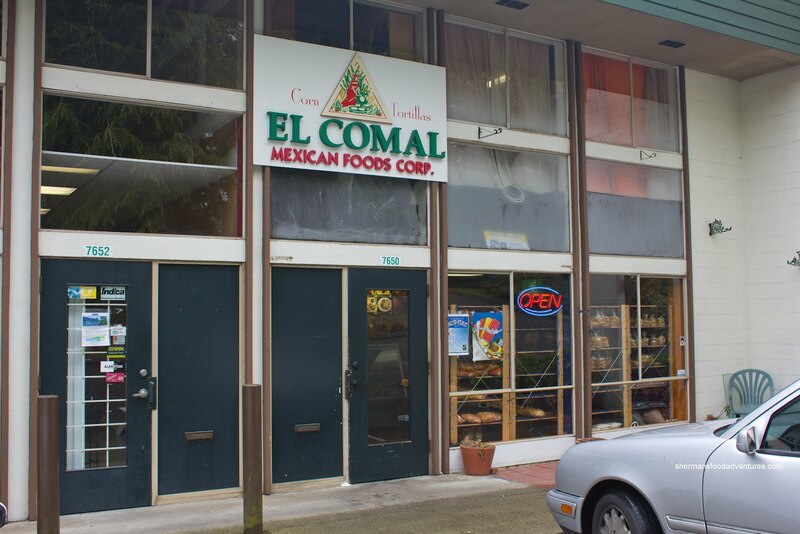 Would this visit to El Comal be 3 for 3? Looking over the menu, I decided to start with one each of the chicken, beef and chorizo Tacos. These were more Tex-Mex than anything with meat, cheese, lettuce and tomato in a soft tortilla. I found them quite mild including the chorizo. 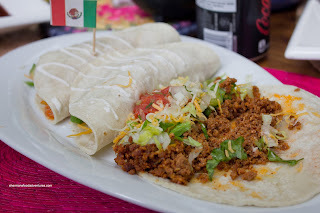 The meats were on the drier side, but these were decent if one wasn't expecting an authentic taco. 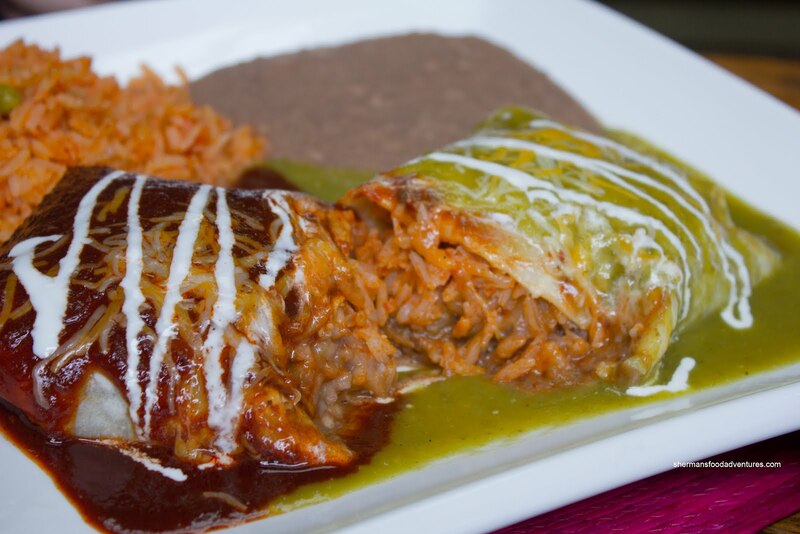 For my main, I had the Veggie Tamales served with rice and refried beans. For something that looked so flavourful, it turned out to be rather flat. Even with peppers inside the tamale, it was lacking in flavour. The masa was a little stiff, which meant there was less lard (more healthy, but not as tasty!) I'm sure they eased up on the spice level to appeal to more tastes though. Again, this was acceptable for what it was. 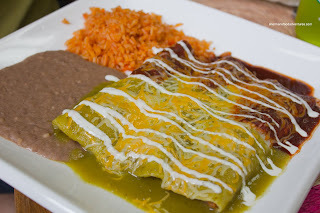 Big D had his go to dish being the Beef Enchiladas with salsa verde and salso roja. He graciously let me attack his food for the sake of the blog (what a nice guy!). Again, despite the vibrant colours, the flavours were muted. The shredded beef was moist and in the end, it was pleasant enough to eat. Slick ended up with the Beef Burrito which was quite substantial. It also came with rice and refried beans as well as the same 2 sauces. I never got to try this, but it was essentially the same flavours as the enchiladas which meant it was not exactly mind-blowing. Yet, he enjoyed it nonetheless. Actually, that sorta sums up my experience as well. Despite the lack of pop from the food, I thought the eats were decent. I would go to Taqueria Jalisco and Taqueria Playa Tropical first though.